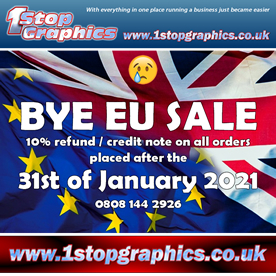 BREXIT SALE - 10% refund on sign, banner or vinyl printing orders. 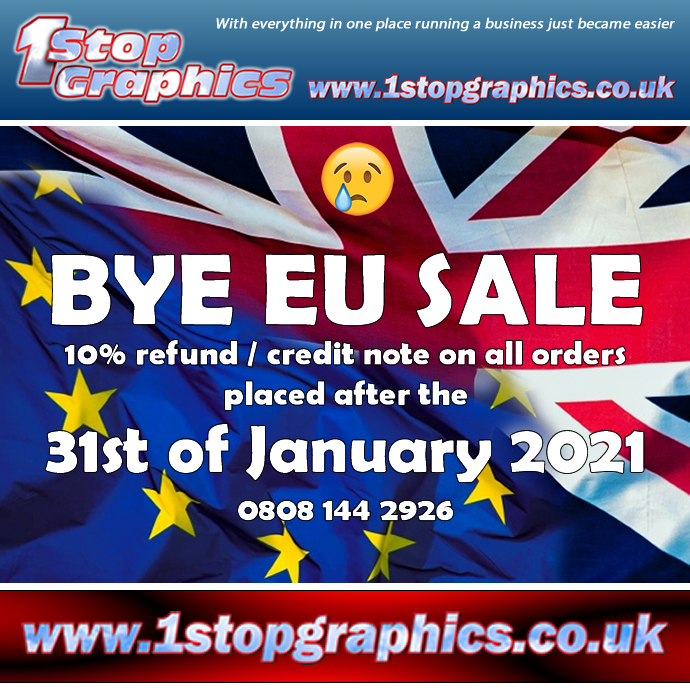 Description The Brexit Sale - Extended again to the 31st of October 2019, add the code to get a 10% refund and credit note on the fully paid, sign panel, self adhesive vinyl or banner printing job. There is no custom print available for this item. If you would like to have a custom item created similar to this please get in touch with us and our sales staff will make every effort to assist you. All goods will be shipped with a next day courier service when they are ready to be dispatched. Tracking numbers will only be supplied upon request. When receiving goods from our courier, ensure they are checked thoroughly for any damage before signing for them. If it is not practical to do this, please sign and write "Unchecked". Double Image Designs Limited will not accept any responsibility for goods that have been damaged in transit once they have been signed for, unless the couriers delivery note is marked "Unchecked". Should a product have been ordered incorrectly by the purchaser it will be subject to a restocking charge of 30%. Double Image Designs Limited must be notified 10 working days prior to the goods being returned or the delivery may be rejected. If the goods had custom printing on them no refunds will be made, unless we have made a mistake after the artwork was approval. All products are sold with the understanding that the buyer will test them in actual use and determine for him or herself their adaptability for the intended use. Double Image Designs Limted, warrants to the buyer that its products are free from defects in material and workmanship, but limits its obligation to replacement of the product. This warranty does not extend to any persons obtaining the product from the buyer. This warranty is in lieu of any other warranty, expressed or implied, including, but not limited to any implied warranty of merchantability or fitness for a particular use, and of any other obligations or liability on Double Image Designs Limted part. Under no circumstances will Double Image Designs Limted be liable for any loss, damage, expense or consequential damages of any kind arising in connection with the use, or inability to use, Double Image Designs Limted products. An overrun or underrun of 10% shall constitute an acceptable delivery of Made-To-Order products, in order to allow for final inspection (not applicable to orders for engraved name plates, valve tags, or pipe markers). Account nett 30 days (UK Mainland and Offshore) – Please contact our sales team. Cheque with Order – Please contact our sales team.